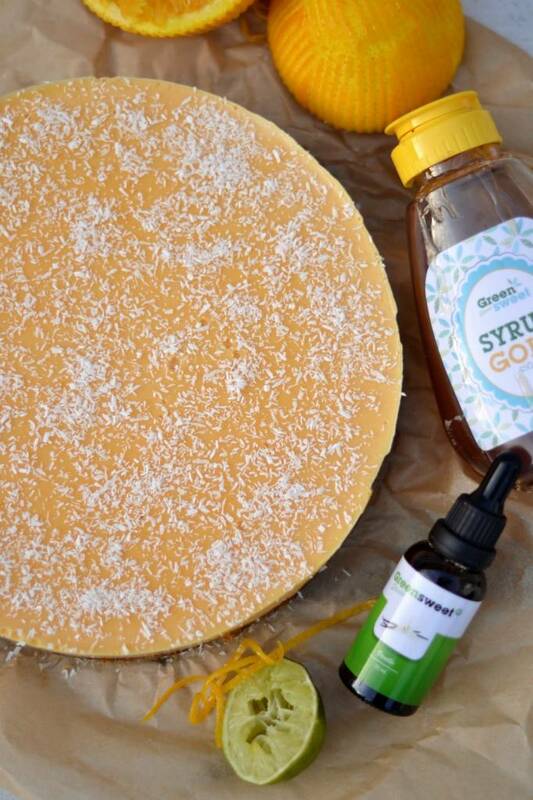 A delicious variation on cheese cake from Manon from Vegan Flavors, in which she applied Greensweet syrup and Greensweet processed liquid stevia vanilla. and 4 grams of agar. Take a 22 cm cake tin and line the bottom with baking paper. Grease the edges with vegetable butter. Also make sure you have room in the refrigerator. Put the pieces of raw pumpkin in a saucepan with water and bring to the boil. Cook the pumpkin al dente in about 15-20 minutes. Drain then and allow to cool. Put the pecans together with the fresh dates or date paste and almond flour in the food processor. Turn on and when you have a sticky dough ball it is ready. Is it too dry? Then add a splash of water. Make sure it does not get too wet! Express the dough ball in your pie shape and put in the refrigerator. Clean the food processor and add all ingredients (except the agar) for the filling. If you have an even smoothie, it is ready. Taste whether it is so flavored. Pour the smoothie into a saucepan together with the agar. Bring to the boil and continue to stir well. After a minute or 2-3 you turn off the fire. Remove the cake mold from the oven and pour in the filling. Put in the refrigerator. Your cake will be hard after about 2-3 hours. When you want to release the spring form, it is best to release the edges with a wet knife. This is how the cake does not tear. Finish with some coconut grater and cut the cake into the desired pieces. You can store the cake in the refrigerator for at least 3 days. Freezing is not recommended or you like to eat ice cream cake!